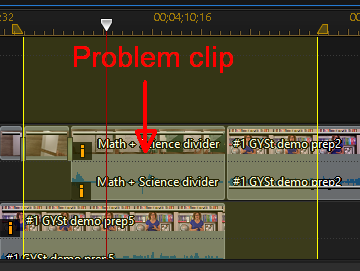 Crashes when I click "Produce"
DrChrisR - Just click no the next time it starts the optimization the next time you open PD17. You can reverse it by going to Preferences/Hardware acceleration and uncheck the hardware decoding box or uncheck both boxes if you want. I don't think that this should stop you from producing videos. Something else must have gone wrong. Try this first. Quote DrChrisR - Just click no the next time it starts the optimization the next time you open PD17. You can reverse it by going to Preferences/Hardware acceleration and uncheck the hardware decoding box or uncheck both boxes if you want. I don't think that this should stop you from producing videos. Something else must have gone wrong. Try this first. Thanks Tomask--I actually uninstalled my version of PD17 and planned to reinstall the program. Unfortunately, when I went to my MemberZone and the My Products page, it did not provide me with the download link, which is odd because I purchased the extended download service when I purchased it on 28 Sept 18. I have submitted two support tickets--one for the crash issue and the other for the missing extended download service. I also updated all of my Intel video drivers. The funny thing is the program worked great until I did the acceleration the other day. I was in the middle of a video project when this all happened. So, I am frustrated at both Cyberlink and myself. I do appreciate your help. Quote ... I also updated all of my Intel video drivers. The funny thing is the program worked great until I did the acceleration the other day. As I understand it, the issue is caused by newer Intel video drivers on specific hardware combinations, so the solution to the crash is to uninstall the latest Intel driver (DO NOT USE the Roll Back Driver button from inside Device Manager!) and manually download and install one of the two drivers mentioned I my post immediately above your first post. Once you regain access to your installer, I hope you'll save it in a safe place so you'll have it handy if you need to reiunstall PD again. Thanks Optodata...I definitely learned a hard lesson with storing the installer on the computer. I understand what you are saying about using an older driver, except I am unsure which driver to download and how to install it correctly. Quote Thanks Optodata...I definitely learned a hard lesson with storing the installer on the computer. I understand what you are saying about using an older driver, except I am unsure which driver to download and how to install it correctly. If you have Win10, you can try downloading and installing the 6194 driver directly from this page. If you aren't running Win10, or if you get a message that the driver isn't compatible with your hardware, go to the main Intel driver webpage, but DON'T use the automated tools since you want to stay away from the latest version. 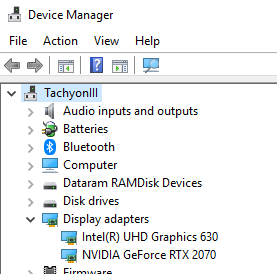 Start typing the details (UHD Graphics 630 in my screenshot) in the box at the top right of the Intel page where it says "Product name or keyword" and then select your graphics chip from the list. You'll then see a partial list, or maybe just the most recent driver version, but if you click on Show more you'll see the previously released versions. The only thing you need to do is find the right older driver that's meant for your version of Windows (eg Win 10 and Win 7 have different drivers), and you'll want to find a version that's dated prior to October 2018. Once that's installed, your computer should be all set to produce again as soon as you reinstall PD. Once Cyberlink releases an update that fixes the issue with the newer Intel drivers, you can resume updating the drivers as new ones are released, but don't update before then. Also, you may want to make sure that Windows' System Restore is working properly, which is the easiest way to restore your system if Windows Update "helpfully" installs a newer Intel driver. There are many helpful articles online to explain how that works. Thank you so much for the detailed methods! Your screenshot is extremely helpful and I will follow these directions. I hope to have this resolved by the end of the day. I will update you once I am back up and running. Again, thank you! I wanted to update everyone on the issue that I was having with PD17 crashing when I try to "Produce" a video. I attempted the fix that was recommended to use an older Intel graphics driver, which WORKED! Anyone else who may be experiencing this issue should check What can I do when CyberLink PowerDirector crashes on a platform that is installed with the Intel graphics driver from a recent Windows update? Thanks to everyone who helped me figure out this mess! Well, now I have a ticket in too. I feel like my issue might be a hair different. Let me explain. My 16 was working perfectly when a window appeared forcing me to update with the new patch from this site.. I did it. Restarted the computer, opened PD, and went back to try to produce my movie. It processed for a few minutes, then closed, and the small window came up to send a report. The PATCH did this to mine. It was fine seconds before I installed the last patch ... which ironically was supposed to help this very problem was it not? I'd love to unistall and reinstall just to try it even though I see it's not helping others, but I am in the middle of an important project that i absolutely cannot loose. Out of curiousity if I did uninstall/reinstall would I loose that saved project or no? (I'm not about to take that risk at this point, but wanted to know). Just in case, I put my dxdiag thing on this post. Quote Well, now I have a ticket in too. I feel like my issue might be a hair different. Let me explain. My 16 was working perfectly when a window appeared forcing me to update with the new patch from this site.. I did it. Restarted the computer, opened PD, and went back to try to produce my movie. It processed for a few minutes, then closed, and the small window came up to send a report. The PATCH did this to mine. It was fine seconds before I installed the last patch ... which ironically was supposed to help this very problem was it not? I'd love to unistall and reinstall just to try it even though I see it's not helping others, but I am in the middle of an important project that i absolutely cannot loose. Out of curiousity if I did uninstall/reinstall would I loose that saved project or no? (I'm not about to take that risk at this point, but wanted to know). I'm sorry you're having trouble, and thank you very much for attaching the DxDiag results. Based on the details there, your system is actually not affected by this crash because you're not using an Intel video driver. To answer your specific question, nothing you do as far as updating, uninstalling or reinstalling PD will affect your project itself, but you should make a system image backup to make sure you can get back to this point if something goes wrong with reinstalling. Again, your project and source clips won't be affected. One thing I'll mention is that the driver for your nVidia card is from last Sept, so you can get the latest one from here. If you're running PD16 and you have just updated to v3424, the latest driver will work fine. If you don't want to install the latest PD patch again, you'll need to use this older driver, because the patch is what allows PD to work with the latest nVidia drivers, which is an entirely spearate issue from this thread! Thanks so much for the help. I ended up trying to do card update and it kept saying I needed Java no matter what I did (I downloaded it). So I ended up trying your second option. I then tried it with othe comparable projects as well as another video produced with the same video clips but nothing edited (added). It all went great! However the current project keeps crashing during rendering. So now, I think I did something stupid. I didn't try other projects, etc, to see if it was the specific project crashing on me while rendering or if it was with everything. In anycase, I've determined at the moment that it is just that project (and not a seperate trial with the same video clips, not effects, etc). So I'm happy the main issue is fine now. I'm mad about my current project I worked so hard on, because I can't seem to figure out why it wont render. It doesn't have complex editing. I know I've moved onto a diff subject here, but .... before I go...... any suggestions? Update! I removed a short particle and a 3 second sound byte and I was able to produce an xavc s fast and easy. BUT when I tried the h.264 avc again it did the same exact thing at nearly the same place (percentage rendered). What in the world. Now I'm REALLY stumped. At least I have my movie thank the lord, but ... geez, I need this to "work right", ya know? Quote Update! I removed a short particle and a 3 second sound byte and I was able to produce an xavc s fast and easy. BUT when I tried the h.264 avc again it did the same exact thing at nearly the same place (percentage rendered). What in the world. Now I'm REALLY stumped. At least I have my movie thank the lord, but ... geez, I need this to "work right", ya know? ps, wanted to add that I"m more appreciative of you and this forum than you can imagine. I earn a bitty income, but this is my "career". If you had to download Java at the nVidia site you must have tried to use the automated tool. You can also directly enter your video card and click the "search" button. The second link was a "results" page and you wouldn't have been asked to install java there. Yes, I used the automated tool and got the Java request. I never ever use Fast video rendering technology nor hardware video encoder. Should I? I never have because every time I see someone comes across a bug in their program the first suggestion is to turn both off. So, I just don't use it. As I said, I took out the effect that I thought might be causeing the problem and it produced the xavcs no problem. But still not the h.264 avc that I always prefer. I rendered a different project using the h.264 and it worked fine. The original project just doesnt agree with the H.264with that one specific project I originally asked about.. I just hope it's a fluke I can't figure out and it will never happen again. Thta's all I can do at this point. I'm undecided onto whether to go on and uninstall PD, then update all drivers, then install PD (with all patches up to date) or not. Well. I have same problem with Power Director 14 in my HP Pavillion (All in one computer) with Windows 10. I had tried with Power Director 17 (free version) with same problem (it crash when I want "produce" a project). Reading post, it seems that problem is with Windows 10 (other user can produce same project with same version of PD in other computer with Windows 7 and works fine). But I have used free version of PD 17 in an Asus computer (all in one, also) with Windows 10 and it works fine.